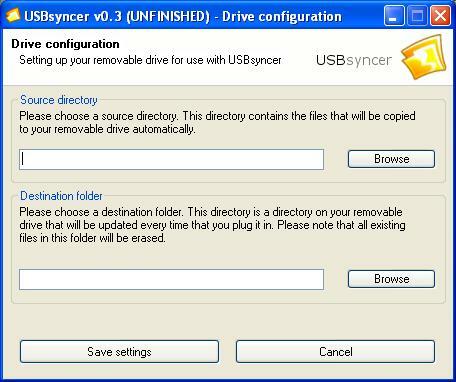 USB Syncer is another small synchronization tool that allows users to synchronize folders in their Windows 2000 and Windows XP. This synchronization program offers synchronization on the contents of a folder in the hard drive with a folder on a removable drive such as a portable hard drive or USB device. The synchronization process is a one-way synchronization. In other words, this synchronization tool allows the content of the folder in the hard drive to be copied to the removable storage device but not the other way round. The synchronization program will ignore the removable storage device if there are changes to its content. USB Syncer will initial the synchronization process automatically when the removable storage device is connected to the computer. Of course users need to configure the source folder from the hard disk and the destination folder prior to it. The latest version of this tiny synchronization tool is USBsyncer v0.3.1 build 060924. Users can get a copy via the link here. The size is approximately 1MB. This simple synchronization tool doesn’t feature a lot of fancy functions but it is just sufficient for users to perform synchronization tasks. Users can make use of it, for instance, to synchronize playlists in the MP3 player, bookmarks, meeting files, project papers, contact lists, etc.